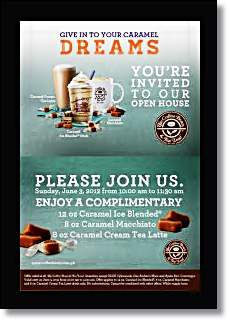 You're invited to their Caramel Open House! :) Today, June 3, 2012. Starting 10:00 a.m.- 11:30 a.m. ONLY. Let's all come together to enjoy their all new Caramel Cream Tea Latte, while you get to try everyone's favorite Caramel Ice Blended drink and the best tasting Caramel Macchiato in town. it was worth it waking up on a Sunday morning and having the priveledge of tasting CBTL "Give in to your Caramel dreams.."
Two thumbs up for your Ice Blended Caramel and Caramel Macchiato!! !